Notes: E refers to Eliwood’s Story and H refers to Hector’s Story. When you have recruited Florina, Fiora and Farina (Farina can only be recruited in Hector’s story) you can make the three perform a “Triangle Attack” together. To use it, position all three sisters so that they surround an enemy like in the image below. As long as all three sisters are surrounding the enemy, when you make any of the three attack they will perform the Triangle Attack, which is a normal attack with 100% critical and 100% accuracy. 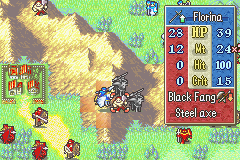 Only Florina, Fiora and Farina can perform a Triangle Attack. In Chapter 18x (Eliwood’s story) or Chapter 19x (Hector’s story), Hard mode only, the boss of the chapter (Aion) will be carrying a Silver Card. Just steal it with Matthew. The Silver Card allows a character to purchase weapons and items for half price. In Eliwood’s story, Eliwood will promote automatically at the end of Chapter 27. In Hector’s story, Hector will promote automatically at the end of Chapter 29. For the other two Lords (Lyn and Hector/Eliwood), they can promote using a Heaven Seal (at Level 10 or above). You get the first one in Chapter 24E/26H from Pent and the second one at the end of Chapter 26E/28H from Hellene. For a limited time, a bonus disk came free with the Mario Kart: Double Dash!! game for the GameCube (in North America at least). With the disk and a GBA-GC cable, it was possible to add some special weapons and items directly to the Fire Emblem game. The transfer also automatically unlocked Songs 99 (Legend of the Dragon God) and 100 (Royal Palace of Silezha) to the Sound Room. The unique weapons/items available are: Wind Sword, Emblem Sword, Emblem Lance, Dragon Axe, Emblem Axe, Emblem Bow and Emblem Scroll. Apparently linking up also yielded various stat-boosting items and a Silver Card. This is a glitch that allows you to control enemy units for one turn. You will need a Mine for this (as the name suggests). Drop a Mine on the floor normally. When an enemy unit moves onto the Mine, wait until they take damage (their HP bar shows up) and then reset your game. You can either soft reset (hold Start, Select, A and B at the same time) or hard reset (switch your game off and then switch it back on again). When you resume your game, you will see the enemy unit get damaged by the Mine. However afterwards you will find that you will be able to control any enemy units that haven’t moved already. If you perform the Mine glitch in maps with Fog of War, you can select and move enemy units that you cannot see, but you’ll have to guess where they are! This glitch also works with the flame traps in Chapter 28E. In Chapter 24E/26H Vaida will be the boss of the chapter. She will have lots of stat boosts, which are actually given to her by her Spear. Her Spear is practically identical to a normal one, but gives a lot of stat boosts. You can get this Spear (commonly referred to as the “Uber Spear”), only if you “cheat”. You will need to perform the Mine Glitch (see above) first. Then, when you can control the enemies, make Vaida move next to Merlinus and deposit her Spear. OR make Vaida trade the Spear with another enemy unit that is carrying a droppable (flashing green) item. Make sure that the Spear is the last item being carried by the enemy unit, because it is always the last item that becomes droppable. Then when it is your turn again, kill that enemy unit to get the Spear. To repair weapons, you will need to use the Mine Glitch. First you will need to find an enemy unit that is carrying a droppable weapon/item (it will be flashing green). Deposit the weapon/item that you want repairing into the storage (Merlinus). When the enemy unit gets close to Merlinus, use the Mine Glitch. Control the same enemy unit and move them next to Merlinus. Select the “withdraw” option and take the weapon/item that you stored earlier. Make sure that it is the last weapon/item that the enemy unit is carrying (because it is always the last weapon/item that becomes the droppable one). When it is your turn again, kill the enemy unit to recover your weapon/item with full uses again. This might be useful for repairing the Lords’ weapons, etc. To “repair” items (like Elixirs, Lockpicks) you can do the above if you want, but there is actually an easier way. Make sure that there are some enemy Thief units around. Have a slow character hold onto the item that you want repaired. Then try and let a Thief steal that item when it is the enemy’s turn. Once the Thief has stolen the item, steal it back with your Thief (make sure they’re faster than the enemy Thief!) and the item should have full uses again. If you make Nils use Set’s Litany on a character and reset your game, the Set’s Litany condition will disappear when you resume. A bit pointless I know, but it’s true. This is actually not possible. Some people think it is, because they have seen screenshots (or sprite sheets) of Canas as a Dark Druid. Those are actually the results of people using cheat codes (or by simple re-colouring Nergal’s sprite). When turning the game on, hold right (on the D pad), L and Select at the same time. If you did it correctly, the game (or, should I say, Anna) will ask you if you want to erase all your data. Agreeing will erase all your game saves, sound room, battle history and supports progress. Warning: If you erase all data, you will be unable to recover it. At the Battle History page (accessed from the Extras menu after completing the game at least once), hold down Select for a couple of seconds. A password will appear, which doesn’t do anything. In the Japanese version, players could submit this to the official site for a contest of sorts. In the Sound Room, press Select to begin Random mode. Once a song finishes, it will change to a different song chosen at random. If you want to change songs, press Left or Right (on the D Pad) to switch to the next or previous song respectively. Also pressing R will toggle the menu on or off- useful for viewing the cut scene art. Whenever a unit is forced to make a movement, hold A, B, start, select, and any direction on the D pad to break free from having to follow the move. To avoid resetting the game, I recommend holding three of the buttons and a D pad direction before pressing the fourth. A major use for this is to skip Wallace’s promotion in Lyn’s Story (Normal Mode). When you select Wallace, break free from the forced movement and make him (or another character) visit the nearby village. This will make his promotion event end without him promoting. A side effect is that you cannot press the B button before the promotion event ends.